In June 2013 I felt it was "time" to create a standalone tab for my growing interest in mechanical (wind up) clocks and watches. It's taken a few steam engine sales and then some to fund this effort, yet I'm already thinning out my timepieces too. As of Sept. 2018, I've parted ways with 8 clocks, 5 pocket watches and 2 wrist watches held for less than a year...collectible turnover keeps life interesting for me. Like I did for my steam engine turnover, I have kept a single photo of the dearly departed under the "Loved but Gone" tab below. Steam will always remain near and dear, but like my interest in model trains, it all gets to co-mingle here in the Temple of all things mechanical. Check out these clocks. Some just tell time and nothing more, others also play chimes, gong and/or cuckoo to signal the time. I find I really like old Seth Thomas clocks...preferably weight driven with visible moving pendulums, but I also have a number of other spring driven examples from various makers. Actually, I collected several of these clocks going back 40 years, but most have been acquired since 2012. Cuckoo Clock (early 1970's) by Cuckoo Clock Mfg. Co. Inc. In his 3rd edition, volume 1 "Seth Thomas Clocks & Movements", pg. 523, Tran Duy Ly describes a clock very similar to this one. Ly refers to this clock as a crossover, assembled just after the 1861-65 Civil War era, using a movement marked "Plymouth, Conn". Ly places date of mfg. at 1866 and describes the clock as a rosewood veneered case, 30-hour, time and strike, column & cornice shelf clock. Ly's description and black/white photo infers the columns are rosewood vs. gilt. Either gilded columns were applied to this clock at time of assembly to use up stock, or the columns were possibly gilded during a later restoration. If done during restoration, the columns were removed from the clock to do the work, as there is no evidence of gilding except on the columns themselves. 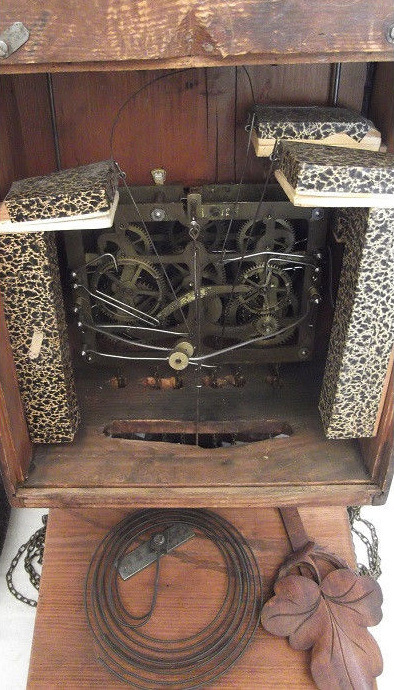 The case per se, clock movement, weights, pendulum, crank key, and upper door glass all appear to be original. The bushes and pivots in the movement are in good shape and have probably been redone at some time as there is no play in the gear train. I cleaned and oiled the movement and it runs beautifully. As of Sept. 2018 I have had this clock for four years and honestly it is my favorite hands down in my small collection. Although meant to be a shelf or mantel clock, I installed a reinforced bracket on the top rear to enable it to be securely hung on a wall. A botched hanger attempt had already been tried, so I was not damaging the clock, just making it function as a wall hanger without risk of it falling off the wall! 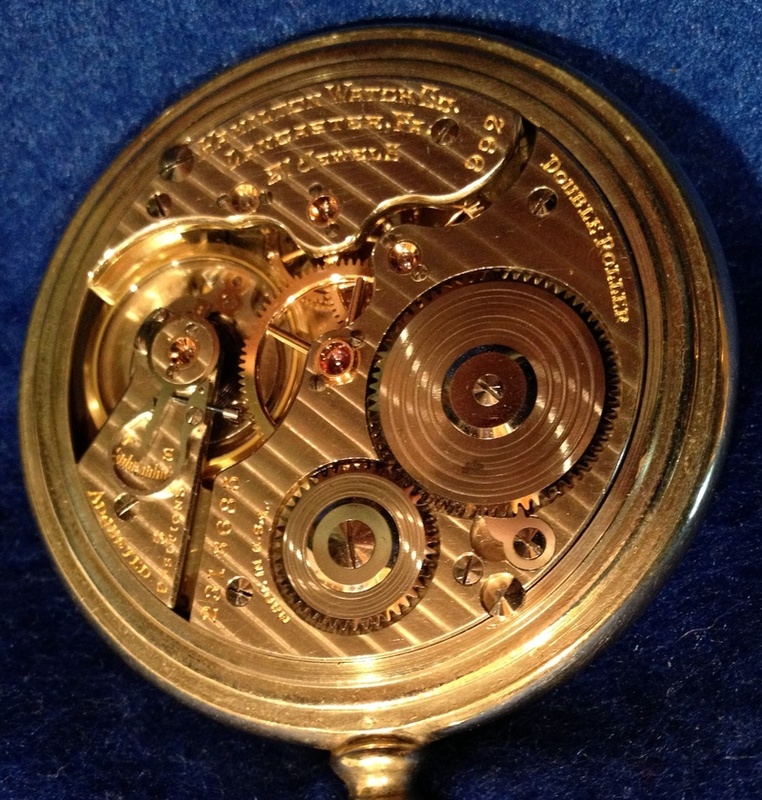 The "Plymouth" signature on the #11 brass movement puts the time frame of it's original mfg. around the early to mid 1860's as Seth Thomas transitioned to using the "Thomaston" signature on their movements beginning in 1865 to honor the memory of Seth Thomas who died in 1859. A very complete history of Seth Thomas and his clock company can be found at www.discoverclocks.com It's really worth the read! 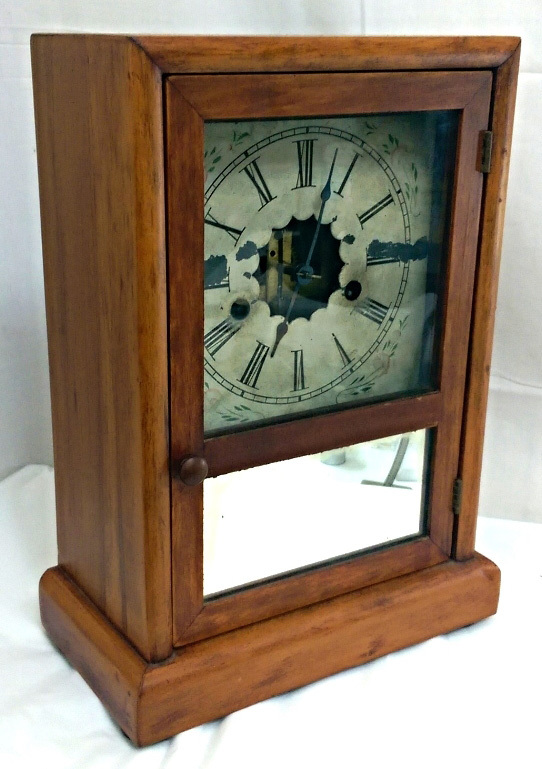 I have no dilusions about the "originality" of this clock...it has had a fair bit of hit and miss restoration over the years done by others, including replacement of the lower glass/tablet, a different/modern replacement dial than the present one, wood refinishing and possibly column gilding. On receipt, I added a correct, matched pair of replacement hands as those that came with it were wrong. There was NO label whatsoever on receipt, so I found and applied a label reprint that seemed correct to the era and the clock. On the bottom it says: Hartford Steam Printing Company, a firm Tran Duy Ly identifies as the label maker used by Seth Thomas from 1860-1865. I am well aware that originally, the lower tablet on these clocks was either a beveled mirror or a reverse painted picture. I could have found something akin to either, but I preferred to keep the mostly clear replacement tablet that came with the clock as it lets me see the pendulum swing, gong sound, weights drop and the label, all interesting things I love to look at. The dial seen below is correct for this clock, though found separately on eBay. It had a lot of flaking paint seen on many older Seth Thomas zinc dials. I am not a fan of flaking dials which I feel detract from the overall look of a clock. I sent the dial out to eBay seller "timetobuyfromguy" for stripping, repainting and aging. I'm delighted with the result seen here, absolutely perfect and NO flakes! The raised area with Roman Numerals and the floral bits at the four corners are especially nice features. Guy and Linda Rivard who did this work are true clock lovers, great artists and very nice people. I love this clock for it's huge proportions... 25.5 inches tall, 14.5 inches wide and quite an imposing piece overall. I have it located on a kitchen wall in a prominent spot and it's happily ticking away. For a total investment of less than $150, how can one go wrong. Much of it is over 150 years old and it's still a grand piece of work that presents well to this day !!! At the time of this entry (Feb. 2015), the Seth Thomas Omaha, early 1886 City Series clock below, is the nicest 1800's clock in my collection...this almost looks new except for a bit of dial flaking. This first release of the Omaha 1886 Time and Strike clock has some nice features not available on later 1894 examples, such as the satin, solid walnut cabinet. The later examples also had a lesser movement than this one. I purchased this example from eBay seller Steve Blackwell. 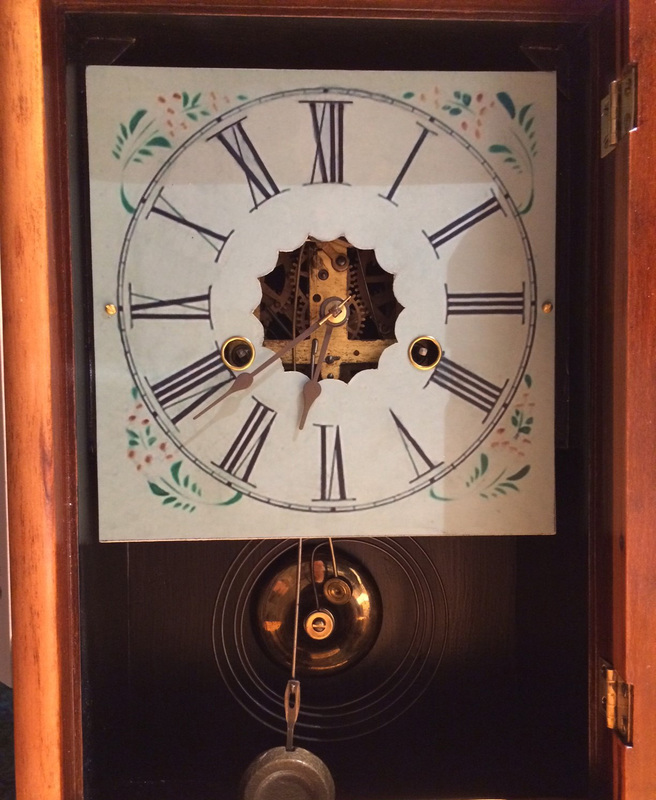 Distinctiveclocks , a real gentleman who fully and meticulously restored this clock's movement to like new operation. Steve also preserved the cabinet's beautifully aged, dull rubbed shellac-over-American black walnut patina in such a way that it retains the desirable satin, dark honey luster and dull rubbed patina. All photos and much of the descriptive text here was Steve's...I could not do it any better, so I used his! I will be keeping an eye on Steve's future eBay auctions...I tend to like perfect! I WON'T be touching this clock, it simply couldn't be improved on! The Omaha is listed in noted authority Tran Duy Ly's "Seth Thomas Clocks and Movements" Version 1, 3rd Edition, page 202. This 1886 catalog version of the Omaha is equipped with the original 6 inch painted dial with black Roman numerals and the signature Seth Thomas full spade cut steel hands. The 8 day Seth Thomas Lyre movement with 5 7/8" pendulum drop is one of the best time and strike movements ever manufactured. This Omaha sounds the hour count with a deep pitch, clear and resonant cathedral gong...with a nice lingering decay of each note. As is typical of lyre clocks of this era, only the hour count is announced, not the half hour. The lyre was professionally disassembled, inspected, cleaned with ultrasonics and all worn pivot bushings were replaced. Both time and strike mainsprings were unloaded, properly cleaned, inspected, lubricated and reloaded. The movement was then properly reassembled and lubricated. Seth Thomas never had such precise instrumentation to calibrate his clocks 100+ years ago, but it's nice to know that even after all this time, this movement was made so well it can be very tightly calibrated with both electronic and mechanical means. While some of my clocks are lesser examples I don't mind restoring or tinkering with myself, this is a fairly rare clock and I am fortunate that it came to me in properly restored and like new operating condition, despite the passing of 129 years since it was first made. I'm in awe that a clock was made well enough and cared for well enough to survive such a duration, it is no wonder there is such a loyal collector following of Seth Thomas clocks. Outlook No. 5 ~ 1921...a simple but pretty Seth Thomas mantel clock. 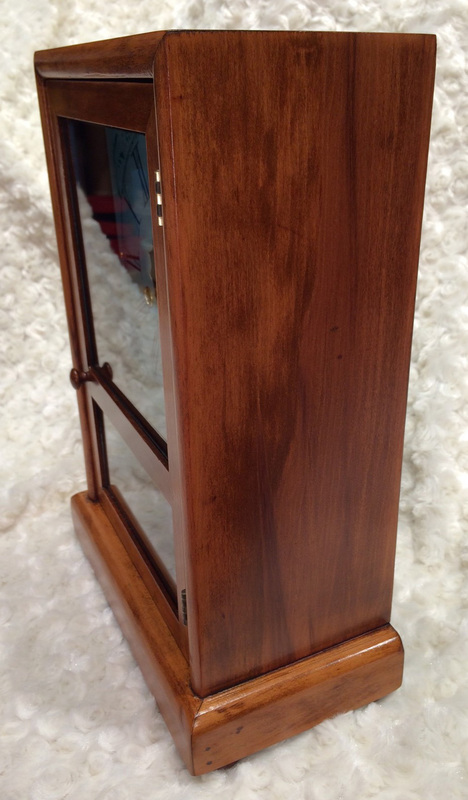 Clock features a mahogany veneered cabinet in what I will call an abbreviated tambour style. In fact, it was those shorter "wings" on the base that attracted me to this example in the first place vs. typical wide body tambour style mantel clock which does not appeal to me. The Outlook No. 5 has an 8 day Seth Thomas 89AL movement striking once on the half hour and counting off the hours at the top of the hour. The cathedral coil gong sounds bigger than it is, maybe due to the case shape, as it sounds like a much larger clock. Measurements of this clock are: 9 1/2" H, 11" W and 5" D.
This is one Seth Thomas clock I did NOT acquire from eBay seller Michael Short, instead another very nice eBay seller gave this clock a basic cleaning and oiling only, not the "nuclear refurbishment" approach I tend toward. But, heck, it didn't cost me much and I am delighted with it, having had it ticking over my desk for almost a month now with no issues. Convex 5" dial and convex glass. Enameled dial with black Arabic numerals and the hands are the correct Seth Thomas iteration for this clock. Gilt sash, dial, bezel and hands hands are all correct and pristeen. The Outlook No. 5 is listed in noted authority Trans Duy Ly's book: "Seth Thomas Clocks & Movements", Third edition, Vol. 1, page 493. I don't believe this clock has been refinished, though seller shared that it had been cleaned and oiled with a product called "Natchez Solution", consisting of beeswax and lemon oil in an FDA quality mineral oil base. Supposedly this stuff feeds the wood with no wax buildup. If that is what gave this clock such a nice wood finish, I'm going to have to get some of it! This clock was obviously well cared for during it's 92 years of life as of July 2013. It looks like it was made yesterday both inside and out. 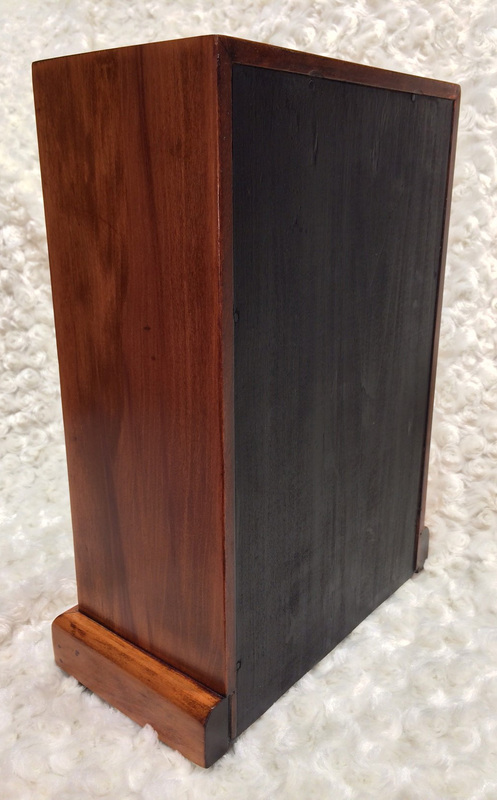 The mahogany veneer is perfect including on the finished rear side. The pendulum is original and the proper two ended key came with it...time arbor winds beneath the numeral 4, strike arbor winds beneath the numeral 8 and just below the center of the dial is the slow/fast adjustment arbor which uses the narrow end of the key. I had the clock zeroed in after a week or so and it keeps excellent time. I added a label direction copy to the inside of the rear door where they were originally affixed. Here is the business end...the 89AL movement. Seth Thomas made the #89 movement in many iterations designed to fit different case shapes...it seems robust and and by all reports a quality movement. UPDATE: Sept. 2018...after 4+ years of flawless operation, this clock just kept stopping on me...cleaning and oiling didn't help other than show me up close that several pivots were badly worn creating slop in the movement. I removed it and sent it for refurbishment by: Back In Time Clock Parts and Restoration. Kevin Souder did a beautiful job on the movement, cleaned to look like new, replaced all pivots and bushings and corrected worn teeth on the escape wheel. 2 week turnaround door to door and it's running flawlessly now, back in it's case. I'm confident this movement will be going long after I've stopped!!! This clock is modest of style, but mighty of sound and it makes me very happy every time it sounds it's gong. This clock was rescued off eBay in August 2014. At first glance I thought it was a charming 1924 era Seth Thomas Salem cottage clock with an 8 day #39A movement...it even had an original Seth Thomas Salem sticker on the bottom. 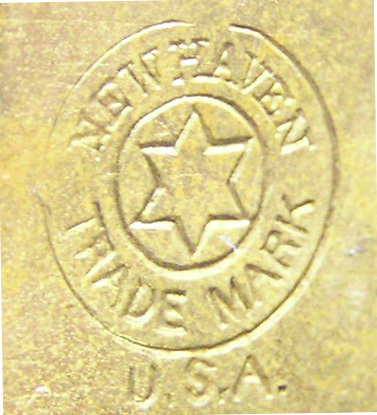 BUT, on close inspection of the seller's photos however, I noticed it had a New Haven Clock Co. stamping on a 30 hour brass time and strike movement, an obvious replacement at some time in the last 90 years, yet the movement fit and operated perfectly. The badly flaking dial was also of New Haven origin and probably came along with the movement when it was transplanted into the Salem case. However, for it's $39 selling price (mongrels don't command much money), I had little to lose, bought it and had no reservations about doing a complete restoration. The solid cherry case was refinished inside and out. The movement was thoroughly cleaned and oiled too. It is now running beautifully with a lovely tick/tock sound. It is now a decent looking and running 30 hour windup clock...granted, a mongrel of sorts, but a pretty mongrel! The mirrored bottom door panel was in poor shape, so I replaced it with clear glass as I enjoy seeing the movement of pendulum and striking of the gong as it counts off the hours. I love the wood on this clock...solid always beats veneer in my eyes...it's really nice stuff! The original dial as seen below was in such bad shape that it would have detracted from an otherwise nicely restored clock. I could not find a dial replacement from the usual sources, so I set out to "create" a reasonable facsimile of one. I found an online photo of a similar New Haven dial with just a few flaws, and used Photo Shop software to "heal" them. The finished image was then printed on photo quality paper, bonded to the clean reverse of the old metal dial using 3M spray adhesive and the surface was then finished off with a clear satin spray sealer. The scalloped center edges and the holes for the arbors were trimmed out with an X-acto blade and the arbor holes were capped off with a couple of those nifty brass rings. As seen below, this treatment made for a very satisfactory replacement for a dial that had seen better days, for next to no out of pocket cost. The insides, reverse and bottom surfaces were also refinished in an era correct black satin paint. These areas on many clocks got little attention during original manufacture let alone during refinishing I have seen done by others. It's been said I over restore my steam engines...same probably applies here and I consider that a compliment. After ticking away for a month on my desk to admire my handiwork, I have moved it to a bookcase in the master bedroom. While the gong strikes off the hour perfectly, I find it best to NOT wind the strike side of clocks kept in a bedroom. I can sleep like a baby to the sound of several clocks ticking, but if they are allowed to sound off the hour, they mess up my sleep. So this one will just tick/tock and look simple but elegant. When I have to put in a bit of effort to bring a clock back to it's former beauty and function, I tend to love it just as much as one costing 10X the price...maybe more! As with my restored steam engines, it's "Rog Value" I strive for, not too concerned about investment value! My fascination with mechanical clocks continues...this one having a maritime background. This example is an American made, Seth Thomas Corsair #6 Marine Wardroom Clock, built in May 1941 and initially installed on a WWII era U.S. Navy Ship, most likely in a wardroom, the mess-cabin of naval commissioned officers above the rank of Midshipman. Unlike my Schatz "Ship's Clock" which sounds off a series of bells to designate change of "watch"...this is a time only clock. The clock's diameter is 7 3/4 inches and depth is 3 inches. 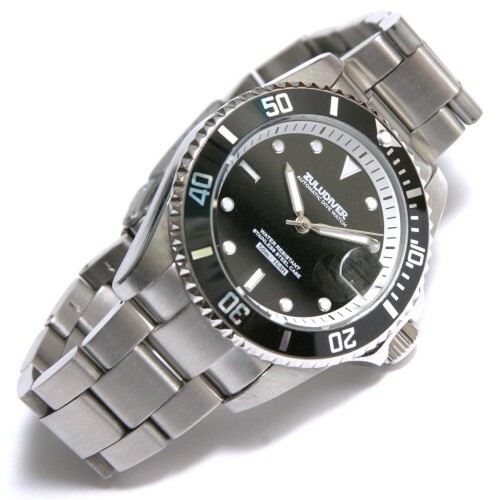 Clock is equipped with a 7 1/2 inch screw type waterproof bezel with original glass. Brass is fully 1/8 inch thick...something not seen on modern renditions of this clock. This same clock can be found listed in the book: Seth Thomas Clocks and Movements, 3rd edition, volume 2, page #774, by noted Seth Thomas authority: Trans Duy Ly. The silvered dial and Seth Thomas signature spade style hands and center sweep second hand are original. The dial has been professionally re-silvered. 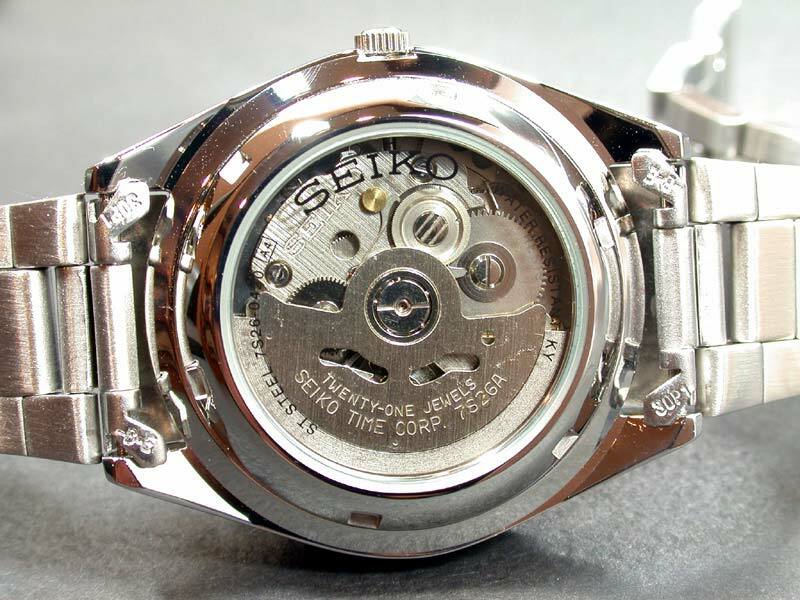 The fully restored, time only American made movement No. 5164, is an 8 day, 11 jewel platform escapement, signed and dated: May 1941. Restoration of movement included total dis-assembly and inspection of all components which were then cleaned with ultrasonics. Any worn pivot bushings were replaced, time mainspring was unloaded, properly cleaned and inspected/lubricated and reloaded into the mainspring barrel. The brass case was re-polished and sealed with a fresh new lacquer finish. The movement was then properly reassembled, lubricated and adjusted. Clock came ready to run, all I did was mount it to a nice wooden backing, attach that to the wall and wind it up...it ran the claimed 8 days on my first winding and kept good time too...can't ask for more than that! The photo below is off an old post card...it shows the Seth Thomas "Marine Shops" in Thomaston, Connecticut, USA, the place this Corsair #6 would have been made. My thanks to Michael Short, clock maker and restorer extraordinaire. Mike did the restoration seen here and sold me this clock...a real gentleman to deal with. Michael can be found on eBay under the seller name: "msho3356". He specializes in Seth Thomas clocks primarily and packs well to protect these jewels. 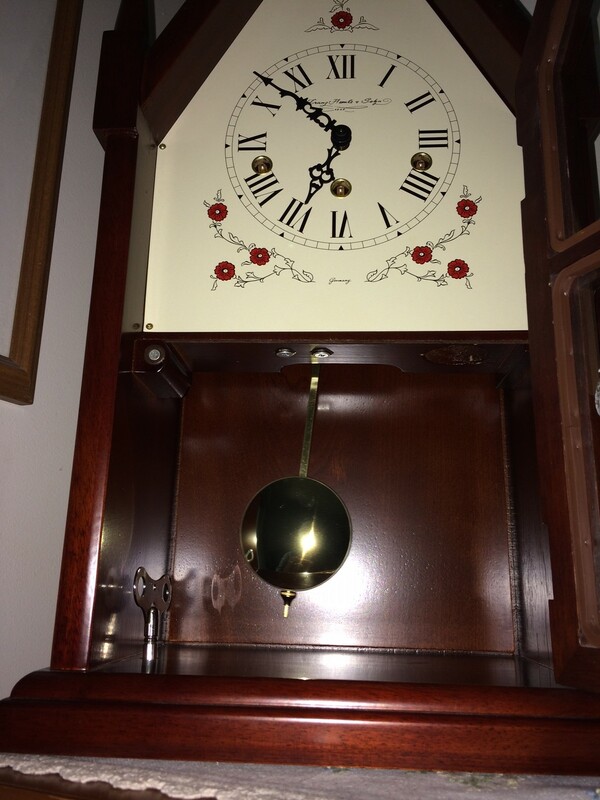 The following photo was from an eBay auction by clock seller "champsclock" (Champs Clock Co. of Douglasville, GA). The stained glass definitely caught my eye when I bought this Hermle steeple clock reproduction, new in early 2014. For many years I sang tenor in a church choir and stared out from the choir loft at a stained glass window much like the one featured as a backdrop for this clock...that photo touched me enough to capture it here! I had been searching for an original Seth Thomas Sharon Steeple Clock (first made in 1924), but most I found were in rough shape or electrified...neither of any interest to me. While the stained glass window ad caught my eye, Hermle's rendering of the steeple clock as well as my own positive experience with this movement maker sold me. Although I purchased this clock "new" in 2014, I found the movement itself was made in 2007 based on Hermle's dating scheme (letter "T" above the Hermle name = 2007 year of mfg.). When the movement and case were mated is unknown, but most likely closer to 2007 than 2014. I believe Champs Clocks had bought a large Hermle inventory which perhaps hadn't moved in a while and hence it was sold at a significant discount. I'm an easy touch for a pretty face and a sale price too! I have had experience now with three other clocks using Hermle movements and I have found them to be very reliable and accurate. The floating balance feature in this clock and one other I have means you don't have to be so particular to absolutely level them. 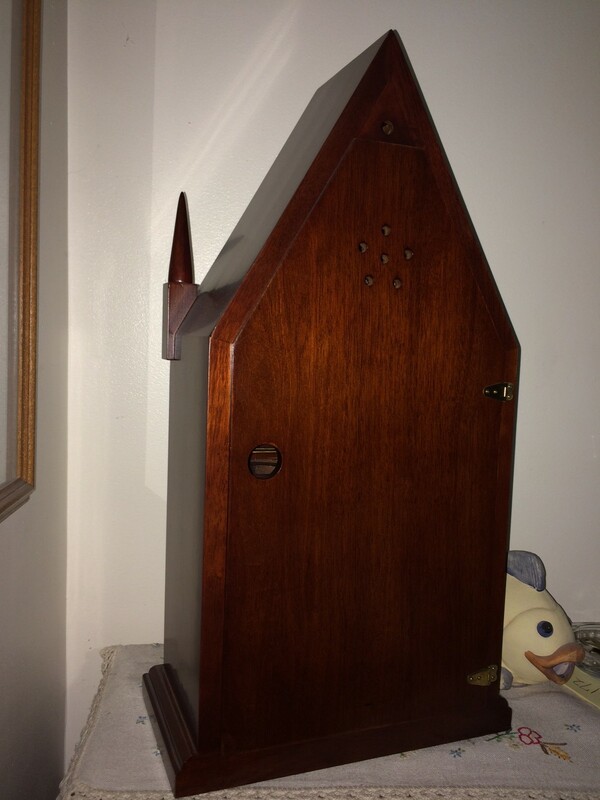 So, in a departure from mostly older clocks in my collection, I opted for Hermle's new rendition of the classic steeple clock and I am extremely pleased with the quality of movement, sound and cabinet eye appeal. Here's my clock on location in the master bedroom atop a bookcase...not as dramatic as a stained glass window for a backdrop, but I don't have one of those handy! The cabinet is made of solid mahogany and veneers with an elegant satin cherry finish. The two pane glass door has etching to the lower half that nicely sets off the brass pendulum. Cabinet dimensions are: H 21 5/8" x W 11 3/8" x D 6"
The dial is similar to the original Seth Thomas version with leaf and vine motifs, black Roman numerals and black metal serpentine hands. The reverse is nicely finished as well and a door swings open to access the movement and pendulum. 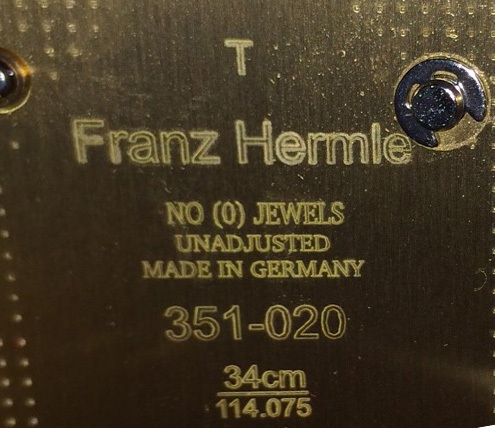 Hermle incorporated their German made #351-020 8-day, key wound mechanical pendulum movement that plays 4/4 Westminster chimes on 5 hammers and counts off the hour. The included "silent" lever is an option if all that chiming interrupts sleep. Notice the finish inside the cabinet...it's as nice as the outside, something usually given little attention in most older clocks I've seen. I love the overall presentation. Nearly one hundred years ago, Franz Hermle began manufacturing and selling mechanical clocks. In 1922, he founded the Franz Hermle Clock Co. of Gosheim/Wuerttemberg, Germany. They have continued to build the company into a worldwide leader in the manufacturing of clocks and mechanical movements. Now in it's third generation, Franz Hermle and Sohn employs over 500 people in 4 locations in German and an additional US facility. Hermle has been the maker of Seth Thomas clocks and movements since the 1950's when the Seth Thomas factory was flooded out of business, a fact virtually unknown to the casual clock buyer that buys the Seth Thomas "name". Hermle clocks and movements have also been sold under names such as Howard Miller, Sligh, Ridgeway, New England, Emperor, Hamilton and more. This is my first complete clock made under the Franz Hermle & Sohn label and I am very well pleased. Hermle's Black Forest Steeple Clock, Steeple Mantel or Shelf Clock was originally sold years ago through the NEW ENGLAND Clock Company. Unfortunately, Hermle seems to have discontinued manufacture of this specific clock. Examples are still out there at several websites and occasionally on eBay, but supplies will dry up if they are no longer being made. No idea why...styles come and go, but if you like it, shop for one soon! Antique clocks are wonderful, but a quality reproduction is pretty nice too...it even comes with a "new car" sort of smell! This beautiful Seth Thomas No. 2 regulator is a reproduction manufactured by Chervin Woodworks in Hawkesville, Ontario, Canada ~ circa 2013 !!! You can still find old, original Seth Thomas No. 2 clocks on eBay and other outlets, but I was impressed enough by the Chervin product to opt for a brand new, but historically accurate rendition. No regrets buying new, this thing is gorgeous in every way and with a weight driven Hermle movement, the mechanics are solid as well...runs perfectly and is incredibly accurate after just a couple of weeks getting it dialed in. I own a number of original, antique Seth Thomas clocks and I love each for it's uniqueness and history. BUT, it sure is nice to experience a "NEW" Seth Thomas clock, even if it is a reproduction. It's a bit like buying a new car...there is just something nice about NEW! 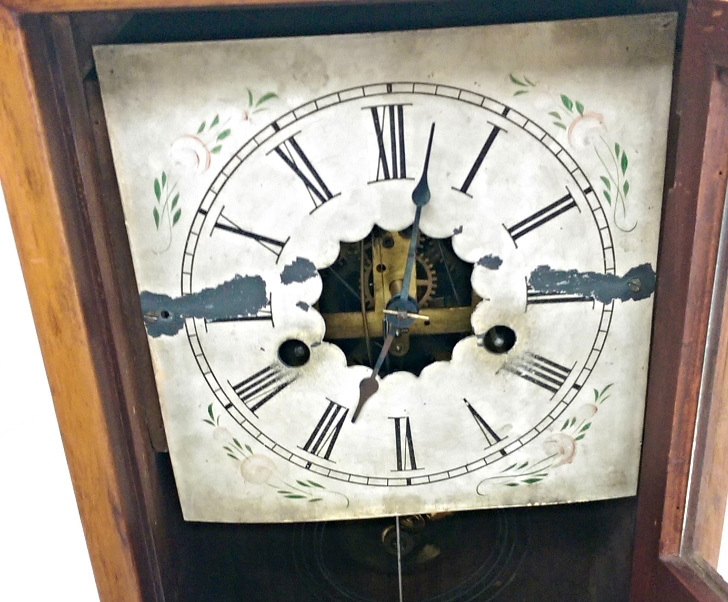 Size: 36" H. 16" W. 6" D.
In the early 1860's, the Seth Thomas Clock Co. began production of the No. 2 Regulator, a clock that graced the walls of railroad stations across North America. The clock was produced, with very few changes, for nearly 90 years until 1950, likely the longest produced single model in clock manufacturing history. Although the Seth Thomas Clock Co. no longer manufactures this clock, this authorized, Seth Thomas labeled reproduction, is now being made exclusively in Canada by Chervin Woodworks. Through careful study of the original clock and precise painstaking craftsmanship, this clock has been produced to match the original down to the very finest detail. Quality is superb IMHO! If you look closely at a piece of fine antique furniture, you will find a unique grain pattern generally not found in newer pieces. That's because fine furniture, like the Seth Thomas Regulator No. 2, used to be constructed with quarter sawn lumber, an expensive but attractive method of cutting the wood to achieve dramatic results. 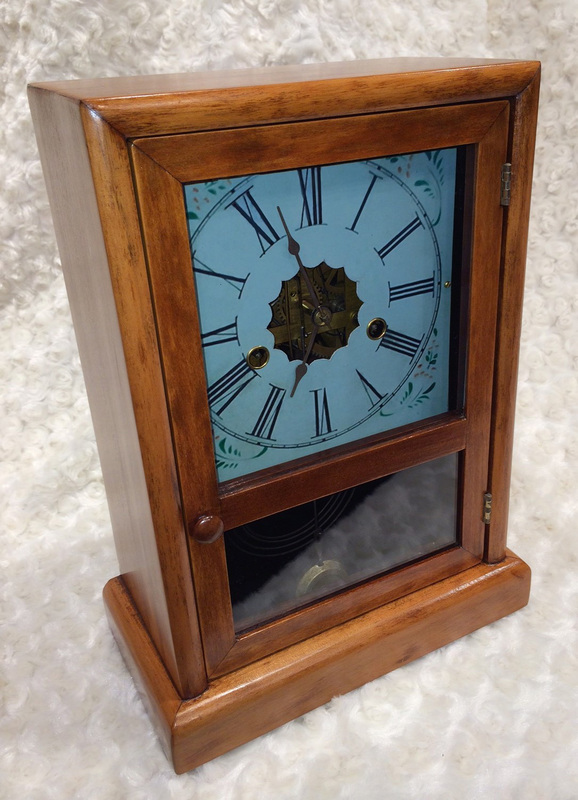 Chervin have replicated that process and crafted this case using solid quarter sawn white oak, even using solid oak in areas where Seth Thomas used veneers, increasing the weight of this clock by over 20% vs. the original. 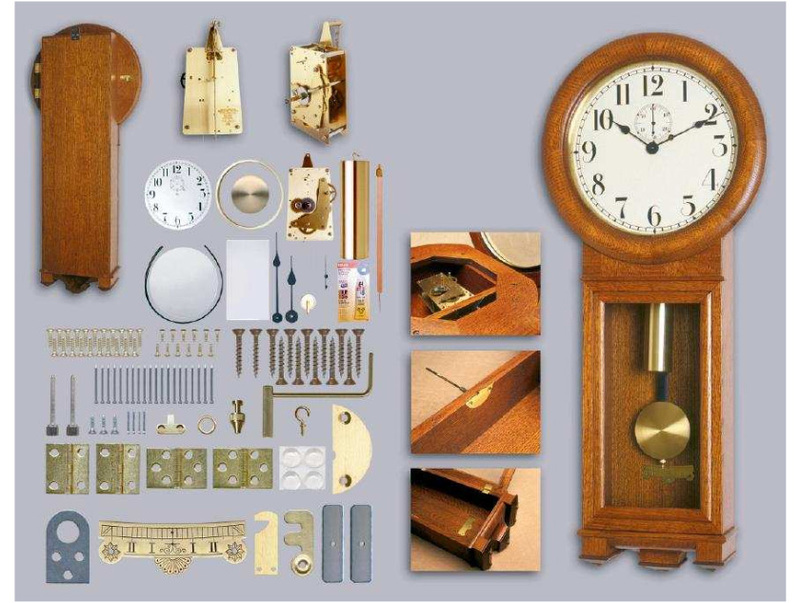 Chervin even used an 8 piece assembly of wood around the glass dial door like the earliest Seth Thomas No. 2's (later Seth Thomas No. 2's went to a simpler 4 wood piece assembly). No corners were cut with this fine case...even the rear side is finished as nicely as the front! The joining methods and hand rubbed finish are done superbly. Hermle of Germany, produces the weight driven, eight day movement used in this clock, recreating the No. 77 "trapezoidal" movement made by Seth Thomas. They even included "Maintaining Power" in the movement, just like the original. While Hermle builds the movement, Chervin owns the worldwide exclusive rights to it. I find this is my favorite clock to wind. It is very satisfying to crank that heavy weight up effortlessly to do it's thing for another week. 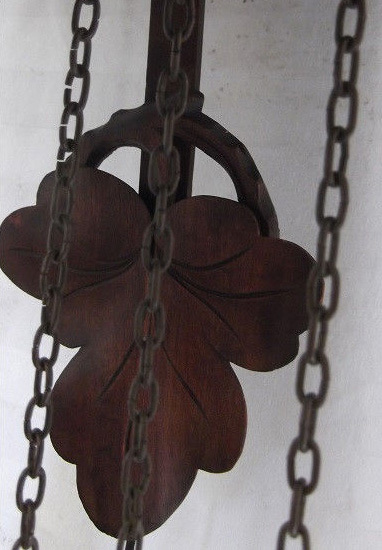 To wind and lift the weight, you crank the arbor to the right and above the center of the clock face using a replica cranking tool like that provided by Seth Thomas. 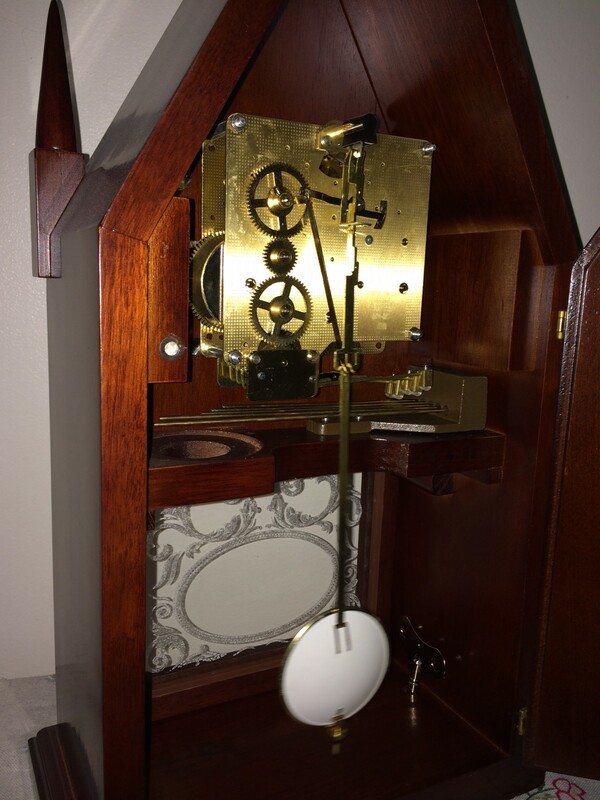 With the weight cranked up to the top of the case, the pendulum will slowly and silently sway for another 8 days, though I have all my clocks on the same 7 day winding cycle for convenience. I am very pleased to be an owner of this Chervin reproduction, in time I believe it will become a classic unto itself. Acquired in March 2014, this large cuckoo & quail clock is a 22" tall x 16" wide, 1903 vintage, weight driven example by Geo. Kuehl and Co. Clock is built of solid walnut with a deep rich caramel reddish tone to it. Clock features a GK signed, 30 hour heavy brass plate movement that sounds off on the quarter hour with the deep rich sounding call from one of TWO birds. Cuckoo and quail models like this are much less common than standard cuckoo clocks. Once every 15 minutes the quail emerges and peeps 1, 2 or 3 times, announcing the number of elapsed quarters. At the top of the hour the cuckoo bird calls the hours while a two tone gong accompanies him. Kuehl operated as Geo. Kuehl Cuckoo Clock Co. of Schleswig and Black Forest Germany, manufacturing in Germany and importing finished clocks to the US in the late 1800's and up to about 1908. His early clocks bear a "GK" stamp on the movement. The movement was likely made for Kuehl by Jos. Burger, Schonach, Germany, one of the largest movement producers in Germany at the time who made custom "stamped" movements for many of the larger clock producers. 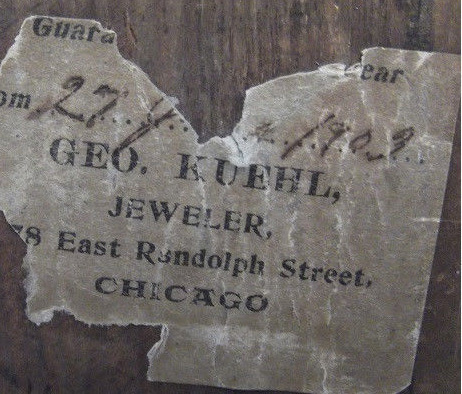 Retail sales in the US took place out of the Kuehl Jeweler operations in Chicago, Illinois. Kuehl started a US based manufacturing operation for Black Forest style clocks including cuckoo's about 1908 that continued into the 1920's. Given this clock's 1903 sale date, it would have been manufactured by Kuehl in Germany and then imported into the US and sold under the Geo. Kuehl name. A 1905 Kuehl advertisement shown below, features an illustration of a very similar clock to this one, though the juvenile deer are reversed. Since those deer screw on to the clock case from the rear, they might well have been reversed sometime in the past 111 years! Personally, I like them looking inward! GK (George Kuehl) was one of the best quality makers of his day and his name is right up there with others like BEHA, GHS, KETTERER, PHS, WEHRLE, JEAGLER, FLEIG, KLAUSMANN AND BEUERELE. It is well known that these higher end makers at times shared their carver's services. Very similar carving styles can show up across examples from any of these makers as one man might have done his work for several of them. 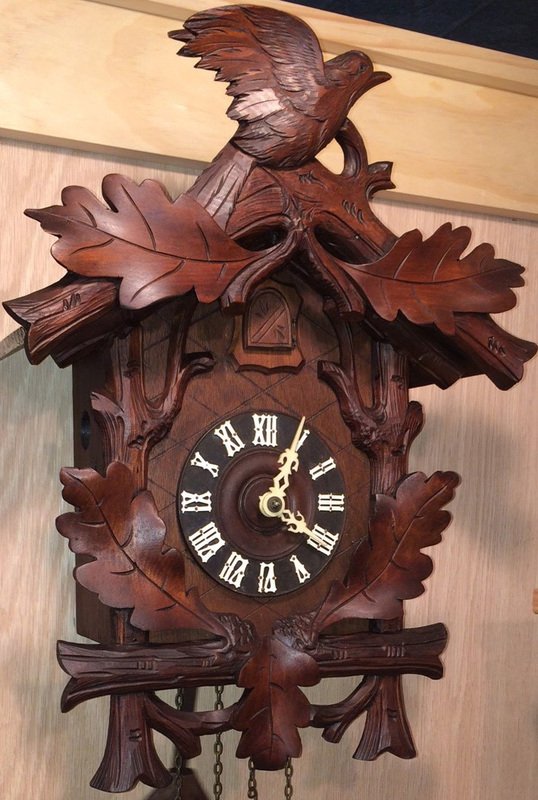 The high relief wood carving quality on this clock is outstanding and well above average. All carvings are gorgeous and in deep wood tones. Leaf and floral carving is unusual and done in full relief. 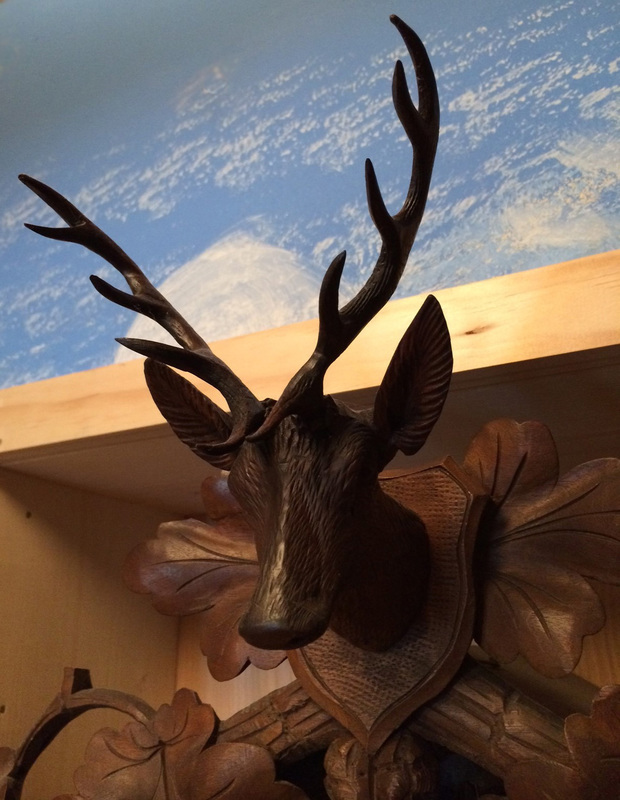 The stag at the top has it's original, nicely carved antlers standing more than 3 1/2 inches tall !!! To the left and right of the 6" dial stands a pair of juvenile deer seemingly looking up to the stag above. I would love to know the name of the man who did the carving seen here. His stag head and juvenile deer carvings are what attracted me to this clock, more than the GK name! The original, adjustable carved pendulum complements the overall carving quality and almost certainly was carved by same man who did the rest of this clock. The ornate, carved bone hands match and are absolutely perfect, not a chip on them, with pinpoint sharp ends...exactly as carved. Roman numerals on the 6" dial are attached with small brass brads. Paired doors await opening at quarter hour intervals. The 100% original cuckoo and quail birds are hand painted, a bit shabby, but not too bad. Enough of the original label is present on the reverse so that you can see the Geo. Kuehl name and sale date. As best I can make out, Kuehl sold this clock on the 27th of Jan, June or possibly July 1903, making it 111 years old as of this writing. The clock runs well and an examination of the large heavy brass plated "GK" marked movement indicates it has seen very little wear. Bellows retain their original leather and tops. Gong is a twin coil version that sounds 2 deep and rich tones simultaneously when struck. My thanks to the owners who preceded me, for the care this clock received over these many years. May I continue it's stewardship for future generations. To keep this clock in pristine condition, I built a custom wall recess next to my desk. The recess protects the clock from human passers by, but more importantly from our frisky golden retriever Doug, whose tail could otherwise entangle the chains and pull the whole works down. I take my stewardship of this fine clock seriously! In summary, a beautifully executed and rare cuckoo and quail clock. 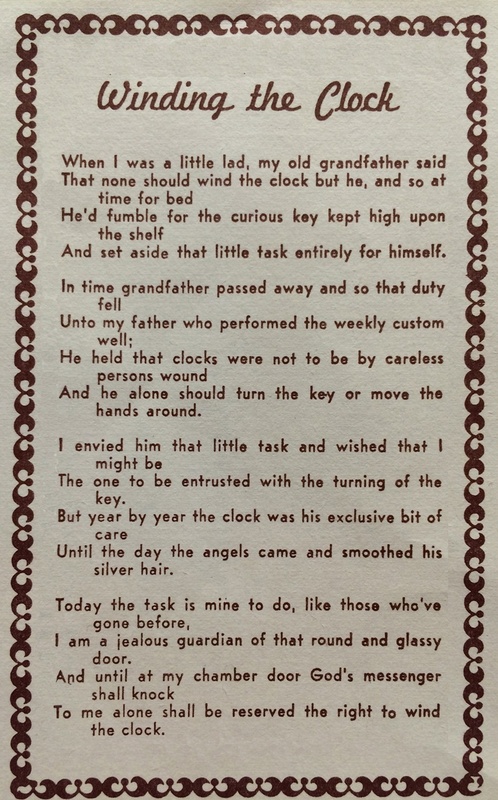 A word of thanks to Jeff Richards of www.antiquecuckooclock.org (the cuckoo doctor), who sold me this clock and provided much background information in the process. The American Cuckoo Clock Co. of Philadelphia, PA was at one time the largest importer of German Black Forest Cuckoo clocks into the U.S.A. They began operations here in the late 1800's. Unfortunately, they suffered unacceptable overseas shipping damages to the delicate carvings. Their solution was to import the parts including wood that it took to build these clocks AND German carvers/assemblers to put them together. In essence the clock featured below is a German Black Forest clock, built by Germans, but in an American workshop! It has been dated to about 1910 by a knowledgeable friend, Jeff..."The Cuckoo-Doctor". This clock is a sizable affair at 17 inches tall, 14 inches wide and 8 inches deep (height measured from top of carved bird to bottom of pendulum...not counting weights). While American made lots of these, an example in this nice shape is hard to find. It caught my eye as it looks exactly like the one that hung in my Grandma's living room when I was a kid...50+ years ago now! I received this clock from an eBay auction in Dec. 2013 and over the next few months I disassembled the case to repair a number of age cracks. I also cleaned the case wood and the external carvings, then re-stained the works to an appropriate color for the era. Clock as seen above is now happily ticking and sounding both the cuckoo and gong simultaneously on the hour and half hour as of mid March 2014. I'm absolutely delighted with how this turned out. Photo below shows one of the two small doors that open on each side of the case for servicing the movement. Matching round holes on each side are where the cuckoo sounds actually emanate from. Clock originally came with a pair of gold colored weights, but as I had a spare set, I prefer the darker color of those. While I had the clock apart, I cleaned and oiled the movement and my artist wife touched up the wooden cuckoo bird that had lost almost all his original paint...he's stylin' now! This little hand carved bird has an intricate set of wings and lower beak that actually move when he pops out...a jewel of miniaturization. 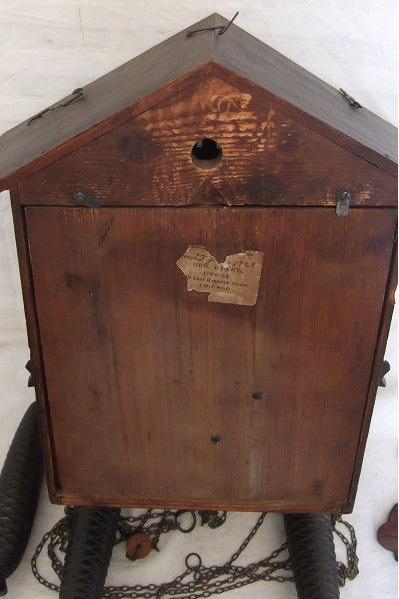 The removable back panel has the original directions and identifies this clock as having been made by American Cuckoo Clock Co. Style No. is "508 1/2"...just barely readable at center top!!! When clocks of this era were built, the case was put together much like a birdhouse from board stock. Separately a piece of Linden wood (or possibly walnut) was carved to form the decorative "pediment" (headpiece) over the cuckoo bird's door. A good carver seems to do his best work here. The wings on that bird are actually a pair of separate carvings done from the same solid piece of wood...side by side, giving it a 3 dimensional appearance. 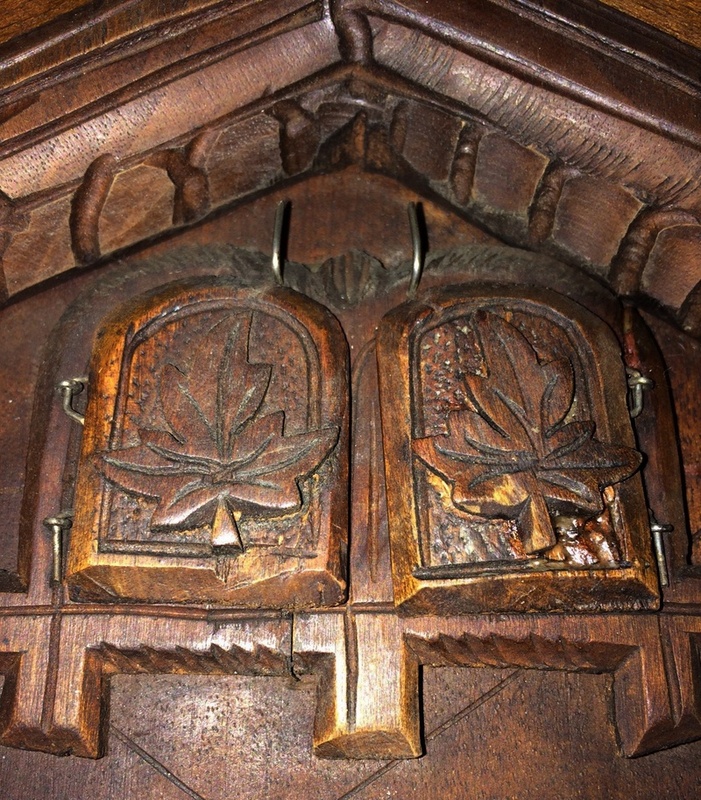 A second piece of similar wood was carved to match and applied so that it wrapped around the dial and framed the entire front of the clock's case. I also own a smaller cuckoo clock I have had since the mid '70's, but it's "carvings" can't hold a candle to the beauty of the above work which truly shows a pride of workmanship. 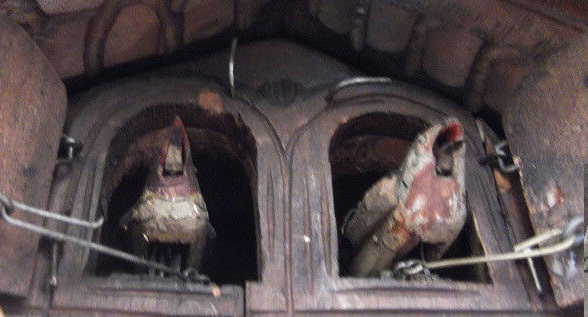 Last photo...the pendulum, pair of bellows from within and clock hands. Bellows with original leather were quite functional as is, so I didn't touch them! The clock's hands appear to be hand made from either celluloid or bone...hard to tell which. They are common to that era of clock manufacture and I've seen them on dozens of other cuckoos from that time. The matching pendulum shows the same outstanding carving work as on the the rest of the clock...I have to think the same carver did all the carving on this clock as it all has the same look of one artisan. Having this clock doing it's thing next to my desk makes me wonder how many owners and places have enjoyed it before me and how many will follow me? Hopefully, my restoration efforts have given this clock a new lease on life and will ensure it lives on for another 100+ years. Note to my adult kids....keep this one in the family ! Although listed third among my 3 cuckoo's, that's just a function of mfg. date, not importance. This clock is actually the first clock of any kind I ever bought. That was more than 47 years ago, so it's kind of special in that regard. It was purchased in my college town of Springvale, Maine at "JoEmma" jewelry shop on Main Street. It was a Christmas gift for my future wife and probably cost me the princely sum of $25 or so, a lot of money to me then. Hats off to my old college roommate "Kooch" who remembered the name of that jeweler...mind like a steel trap that one! 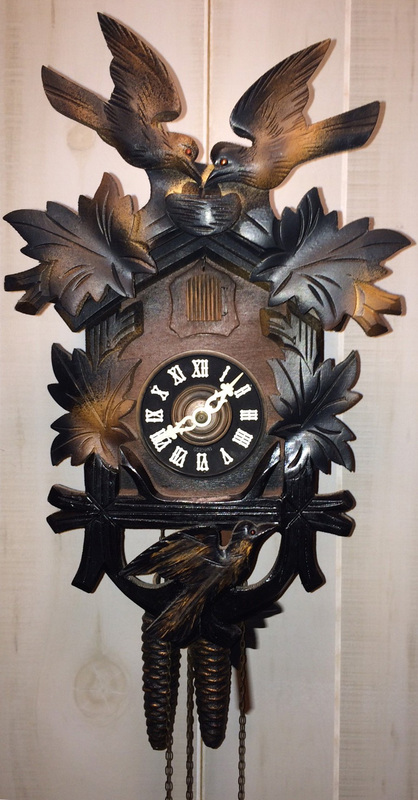 It is a modest affair with simple "carvings" in Linden wood and some airbrushed highlights here and there...but it was my first clock buy and helps me appreciate the joy of such a simple clock vs. more the more elaborate ones I have since acquired. Though gifted to my wife, she "loaned" it back to me for display in my workshop, with visiting rights! Inside, stamped on the movement is the maker's signature: Cuckoo Clock Mfg. Co. Inc. West Germany followed by the number 440. A bit of research shows this was actually a company based in New York City after WWII. They imported clocks bearing their name for U.S. distribution (more on this in the future...a lot of fascinating background to these folks). The clock spans almost 17 inches from top of the pediment to bottom of the pendulum. It appears perfect with the finish exactly as it was hanging in that jewelry shop. Who says dust doesn't form a protective layer! After running strong for about 10 years, it stopped and no amount of coaxing would get it going again. It hung on the wall dormant for almost 30 years. In early 2014 I figured I would try and breath some life back into this clock. I had nothing to lose, so I took out the 30 hour movement, vacuumed out the cobwebs and dust balls and cleaned the case and carvings with Windex. Not the stuff of purists, but it works. The brass movement got a few rinses in Coleman Fluid (naphtha based camp stove fuel) to remove the dried up oil that had teamed up with dust to form a very sticky mess. After drying the cleaned movement with a hair dryer I applied some new synthetic clock oil to all the bushings and now more than 4 years later it is still running strong and is actually very accurate. The cuckoo sounds from the twin bellows are clear and crisp, the gong works as well and the plastic bird does his thing on cue, even bobbing up and down, though no wing flapping on this one, a feature on my higher end cuckoo clocks. It may be an entry level clock, but they need love too! Like my first steam engine, I can't see myself ever parting with this clock, too many memories. This delightful chiming ship's clock by Schatz of Germany, dates from the mid 1960's. It's almost 50 years old yet it looks like it was made yesterday. 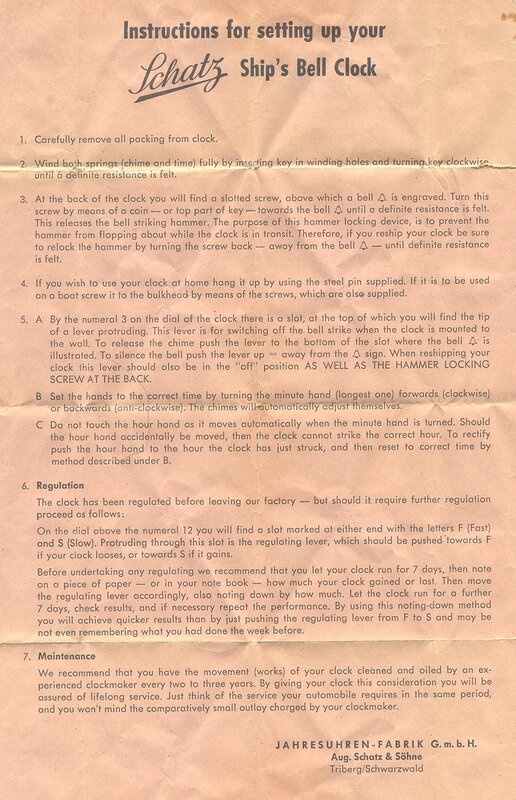 Ship's bell strike is based on 4 hour "watches" onboard ship. A new watch starts at noon, 4 p.m., 8 p.m., midnight, 4 a.m. and 8 a.m. The end of one watch and the start of another is marked by the bell being struck 8 times. A half hour later, the bell is struck once, with an additional strike each half hour until the end of the watch. Then the cycle starts again. The bells are struck in pairs, that is, the first two bells are struck close together followed by a pause, then the next two, etc. The clock is about 6 inches in diameter and stands out from the wall about 3.5 inches. All brass with a beveled glass porthole like face that unlocks on the right and swings open to the left for winding. It features a German made Hermle, eight day "rack and snail" ships bell strike movement with a 7 jewel platform escapement. Along with all my other windups...the Schatz gets wound every Sat. morning, a pleasant routine! I can be smitten by a pretty face and they don't come any prettier than this. I liked my Schatz Royal Mariner Chiming clock so much, I have had an eye out for a companion barometer made by Schatz. Well, here it is, a 1968 vintage example in perfect condition. I know, a barometer is NOT a timepiece, but it is sort of "clocklike" and the matching piece to my Royal Mariner, so here it is!! It matches my clock well, with two minor exceptions...the outer bezel is a bead blasted brass piece vs. shiny brass on the clock and the closure is different, otherwise they are kissing cousins. 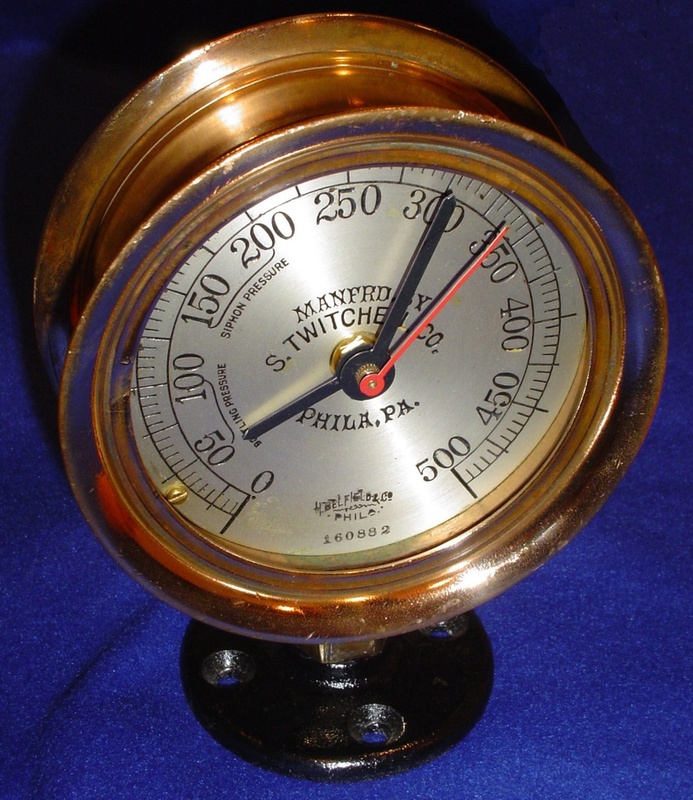 This Schatz Ships Barometer also features a curved glass thermometer and was the top of the line instrument they made. 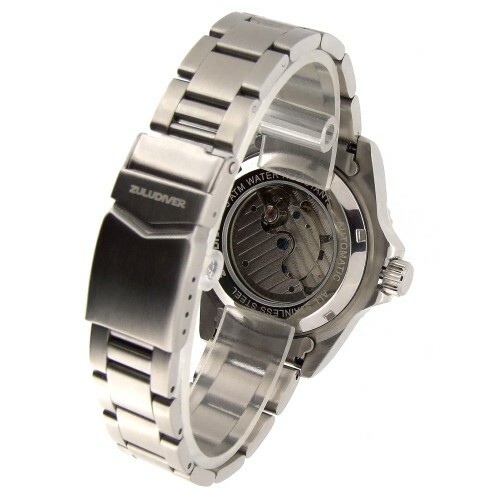 It is equipped with a 7 inch hinged type bezel, overall diameter of 7 3/4 inches and a depth of 4 inches. The glass is thick and nicely beveled. The dial has a white enamel finish and the Schatz signature spade style hand and pointer. The movement is a signed, German made, jeweled holosteric type. I didn't know much about barometers, especially their initial setup, but Google found the info in minutes. Here in the US, barometric pressure reported by the weatherman (or computer or Smartphone app) is always stated in "Inches of Mercury" which inconveniently did not line up with any of the scales on this barometer. BUT, it was an easy conversion once I knew it and I am capturing it here for others and myself should I need to make another adjustment in the future. Inches of Mercury divided by 0.0295 = Millibars, the scale on the innermost arc of this barometer. So, given that the local barometric pressure was 29.77 Inches of Mercury at 5 pm this afternoon, I converted that to 1009 Millibars and using the adjustment screw on the barometer's rear brought it into sync with the local pressure. That setting can be seen in these photos as I just set it before mounting and photographing. Apparently, if you want to take a reading, you tap on the glass first to jar the linkage internally helping it reset to the current pressure. Odd but quaint! Below you can see the inner dial with the porthole bezel swung open to the left...also note the curved temperature tube at the bottom giving Celcius and Fahrenheit readings. Here are the clock and barometer together as mounted on the end of a display shelf in my workshop. They do make a handsome duo and Schatz attention to detail is superb. 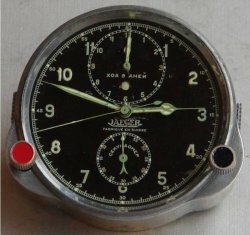 This is an ACS-1 military cockpit chronograph as used in MIG fighter planes. While it has electric terminals on the reverse, those were only meant to connect an internal heater to keep things warm at high altitudes. Operation required pilot to physically wind it up for 2 days of operation. How strange is that!!! My example was brand new as received, packed in a bombproof molded styrofoam box and even had the Russian documentation and QA inspection sheet! As seen above, I mounted the chronograph in an aftermarket black Lucite stand to permit it to sit upright as it is otherwise meant to be console mounted. I picked this piece up from the same source as my Russian sub clocks...the now belly up catalog with the funky name: "Sovietski.com". Again, spare parts from the Russian military sold off for dollars to the West! Having grown up in the Cold War era, there is something sort of satisfying to own these time pieces once held by a rival world power. The chronograph was originally produced by the Molnija Military watch factory in Chelyabinsk, Russia, an area in the South Urals known for it's talented craftsmen. 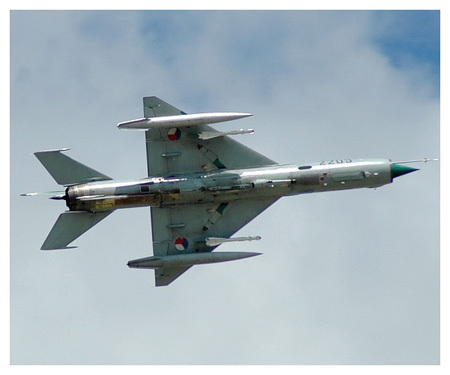 It supposedly dates to the late '70's or early '80's and was the type used in several MIG aircraft as well as the SU-27. 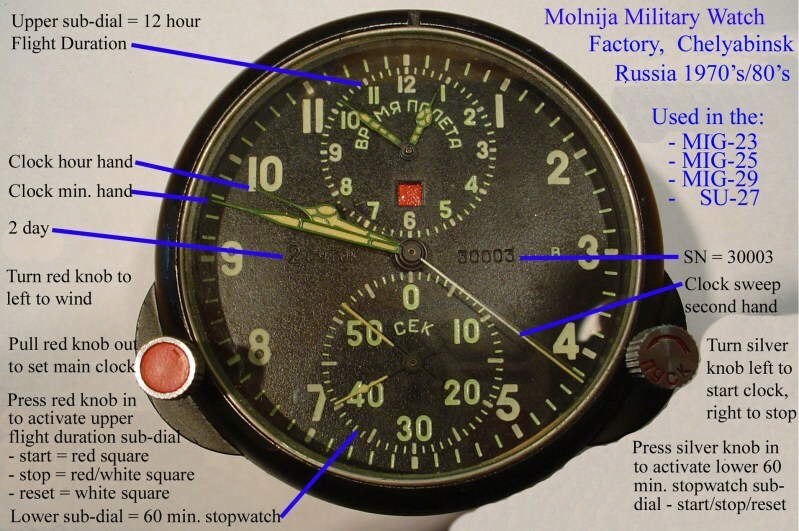 Molnija's MIG chronograph is a copy of the Swiss movement by Jaeger-LeCoultre seen below left. If you are going to copy, copy the best!!! I initially couldn't figure out how this thing worked, but decided one day to really study it and mastered the controls! To document this feat of perseverance, I share the following for other owners who might be scratching their heads. 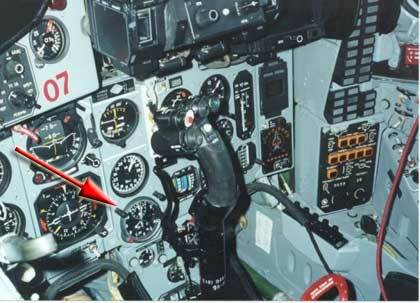 Here is a MIG cockpit photo showing where the chronograph was located. How cool is that! It amazed me that a wind up unit would be used in an otherwise sophisticated aircraft, but I have also learned it's use did not stop there. 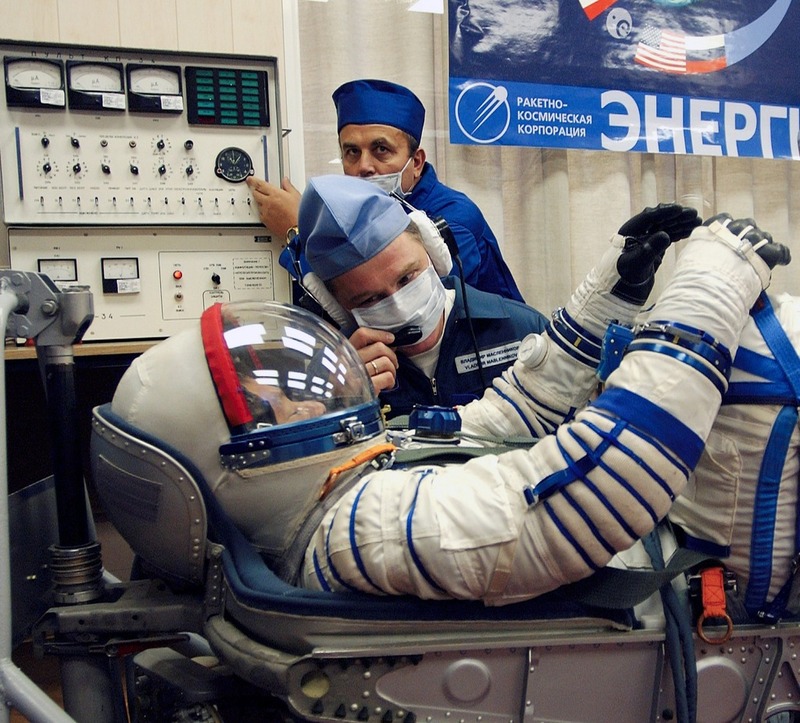 The following photo shows the same clock in use at a ground facility for the Russian space program. The guy pointing at the chronograph below might have been saying... "Vlad, did you wind it today or was it my turn??" Like my Russian sub clocks, I can highly recommend these MIG chronographs which are readily available via eBay. The Russians copied movements from some of the best timepieces of the era but made them very well. YES...I have managed to accumulate THREE of these as of July 2013 !!! The first is an 8 day, 13 jewel, wind up Russian Sub clock bought from a now defunct catalog firm with a great name... "Sovietski.com". This one was made in Feb. 1999 and purchased/mounted in 2001. As best I can figure it, this would have been the third clock acquired in my collection. Not long ago, high end catalog outfits like that seemed to have cornered the market on selling Westerners bits and pieces of Russian military stuff after the breakup of the Soviet Union. Today (2015), similar clocks can now be found via eBay, so they are out there if desired and I highly recommend them...a whole lot of quality/value for not much cost. I am sure this clock never saw the insides of a sub, as it was brand new in consumer packaging when received, but it was made by Vostok of Chistopol, Russia who produced the same clocks for actual Russian subs and surface fleet vessels. This model was designated as the 5-CHM, and such clocks were used by the Soviet Navy's ships and submarines for over 70 years. A photo taken inside the sunken Russian sub Kursk, indicated virtually the same clock was used onboard that modern Russian nuclear sub. I believe the dial graphics on mine might have been jazzed up a bit for the American souvenir market and I have seen several dial graphics versions (two right here! ), but it is still a very nice, well made clock that has been faithfully ticking away over my desk for 14 + years now as of Feb 2015. Built like a tank, the clock's 1/4 inch thick solid aluminum housing is supposedly waterproof and good for any depth charge shocks it may encounter. Face is highlighted with a brass ring for good measure. With the included key the gasketed front opens and swings to the left like a porthole. Once the front is swung open, the same key winds it at the spot above 6 pm position. It ticks with a pleasingly loud sound which reminds me by it's absence if I forget to wind it (which rarely happens). I liked my sub clock so much I bought a second as a "backup" a few years later should this one ever fail. Well, as of Feb. 2013 I began to think since my 1st clock had faithfully run for 12 years straight as of then, it could outlast me. So I just took the backup out of storage and decided if one is good, a second one running elsewhere in the house only makes sense!!! My wife does not see my logic and just rolled her eyes! I mounted my second sub-clock to a former Jensen steam engine wood base and then screwed it securely to a wall over my workbench...it won't come tumbling down from minor earthquakes we get (or depth charges if that should occur). Aside from the graphics and a chrome ring on the face, it looks identical in construction to my first sub-clock. Dang I love these! Since I mounted my backup, I actually went shopping again on eBay to find a replacement "backup"...got it quite cheaply...new in the "Sovietski.com" box from another clock hoarder. On receipt I just could not hide it away awaiting a depth charge that might take out one of my other two. Soooooo, Sub clock No. 3 is mounted like No. 2 on another Jensen steam engine wood base and ticking away in another room of the house. This slightly younger example did not come with the round, black plastic mounting plate and was of a slightly different mounting design allowing direct mounting to a wood surface without the plate. The dial graphics and brass face ring are the same as my original sub clock, not surprising as this one originated from "Sovietski.com" as well. If you cruise this whole timepiece section of my website, you will see I have a penchant for Seth Thomas vintage clocks, but these Russian babies are just a whole lot of cool in my opinion. If you have ever considered buying a high quality wind up clock, you just can't beat the build quality and value of these Vostok made sub clocks. Every guy needs at least one of these!!! Aside from my first clock, an early '70's Cuckoo purchased while in college, it was a long dry spell before I purchased another. This clock would be my second purchase made in Dec. 1986, from the "House of Clocks" in Morgantown, Indiana not far from where I have lived for 38 years now (as of 2018). It is a Regulator Style Wall clock made by Howard Miller with time, strike and Westminster Chimes to announce it's presence. Being a nitpicker for details, I kept the original purchase paperwork, warranty etc. in an envelope taped to the back of the clock. 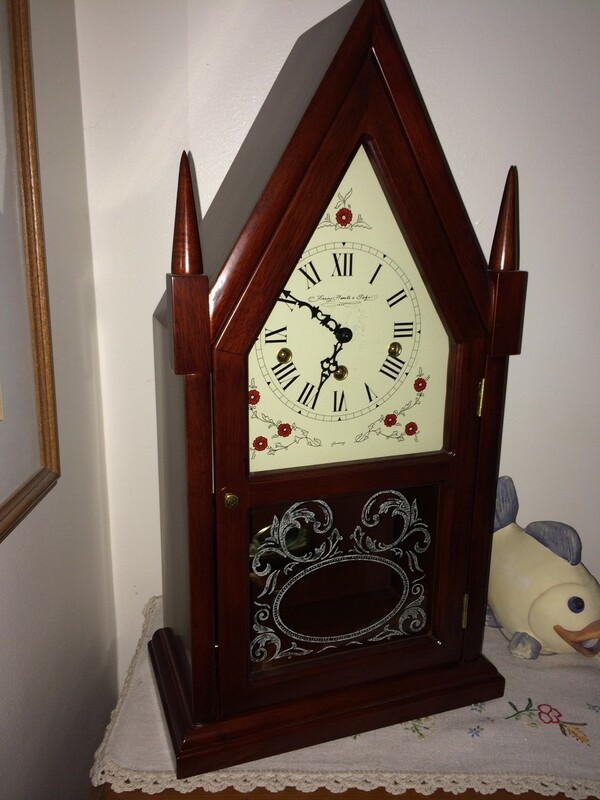 It was listed on the receipt as a Howard Miller Wall Clock Model 612-362. With a wife, new house and 3 kids, I don't know how I ever justified the $286 purchase price! For almost 30 years ago, that was a good chunk of change! That clock hung on our living room wall for about 15 years doing it's thing, as both a clock and a pretty piece of furniture about 25 inches tall x 15 inches wide and 4 inches deep. The wood case is solid, possibly walnut and very nicely done. But alas, as a clock newbie ignorant of the need to clean and oil occasionally...this clock, like my early '70's Cuckoo, simply ceased to run one day. It hung on the wall for a few more years after that and ultimately ended up stuck in the top of a closet...I assumed it was either worn out or needing a repair I could not afford then. Fast forward to mid 2014 and I got this clock down from the closet shelf, took it outside to blow off the dust and decided to try cleaning and oiling to "heal" it's stoppage. After a few hours of painstaking cleanup including my now trusty Coleman Fluid (camp stove fuel) movement dunk and flush routine plus a few drops of synthetic clock oil and Voila....it ran like new. While I had the movement removed from the case, I noted that it was a Hermle 85 #341-020 45 cm. A strange descriptor, but my guess is the 85 referred to a date of mfg. (as I bought it in '86). The 341-020 is consistent with known Hermle movements and the 45 cm might refer to the height of the movement from top of dial to bottom of pendulum (which is in fact 45 cm). Anyhow, that clock has been ticking away nicely on the same wall of our dining room that it first graced in 1986. My now 37 year old daughter spotted it the other day and commented "Dad, wasn't this clock on this wall years ago?" Observant kid...she was just 5 years old when this clock was first hung up and maybe 15 or so when it came down! It's not a rare or even old clock, but like my college Cuckoo, it is a reminder of the working and kid rearing years that followed...so special memories make it a keeper. Here is an example of merging my collectibles. On the one hand, I am a lover of old toy and model steam engines etc., on the other I have developed an appreciation for clocks and watches. Well, here's a good example of the best of both, an old brass water pressure gauge converted into a desk clock. I searched eBay for an appropriate piece to convert that meant something to me, and came across this gauge from 1926, labeled: Providence Pipe & Sprinker Co.
My dad worked in Providence, RI and our family lived nearby. Years later I moved a thousand miles away to the mid-west where I have been for 35 years, so re-purposing this gauge into a clock has a special meaning to me on several levels. Though this conversion is powered by a quartz/battery clock, not a windup, it's just high on the cool scale, I love it! As a parallel to my recent (2012) focus on mechanical clocks, I have also collected a few vintage, wind up, railroad approved pocket watches and several modern wrist watches that self wind with wrist movement. Watches with visible front and rear "display" cases are my favorites as they let you see the movement within doing it's thing...marvelous bits of tiny engineering going round and round!!! All but my Seiko pocket watch offer the ability to see the movement in motion. I seek out this type of watch and feel I have found some of the most beautiful examples out there. Beautiful damaskeened patterns, raised gold jewel settings and solid gold gear trains were the stuff of Illinois Watch Co., especially during their pocket watch years. 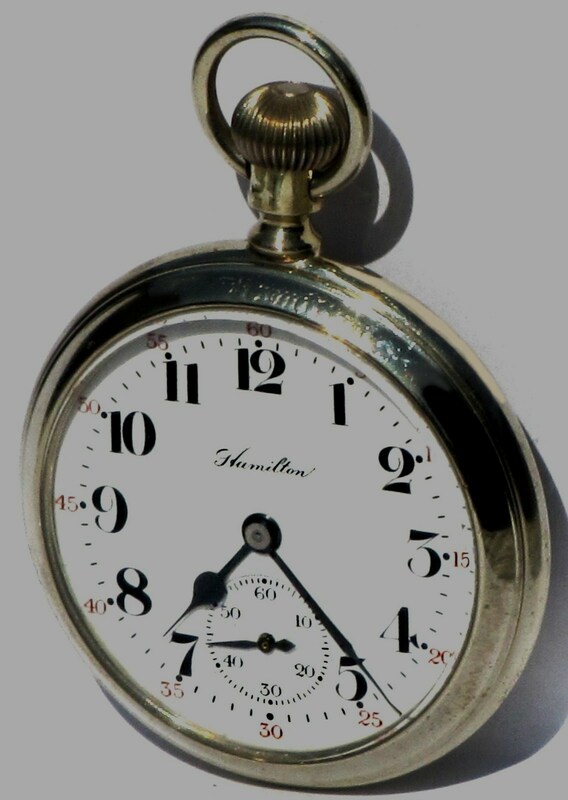 I love this watch, a 1918 example made in Springfield, Illinois...serial number: 3326963. The Illinois Bunn Special, railroad grade pocket watch movement is prettier than anything else I have seen online...it just oozes quality, attention to detail and for me the perfect "look". I buy that which really attracts me and NOT on collectibility per se. 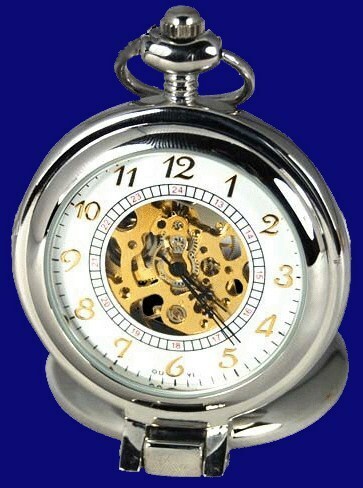 Anyone reading this who can recommend other good looking pocket watches...please email me! The "Bunn Special" name comes from one of the founding directors of the company, John B. Bunn. Along with the Sangamo Special and Santa Fe Special, these were considered the finest of Illinois' railroad grade watches. 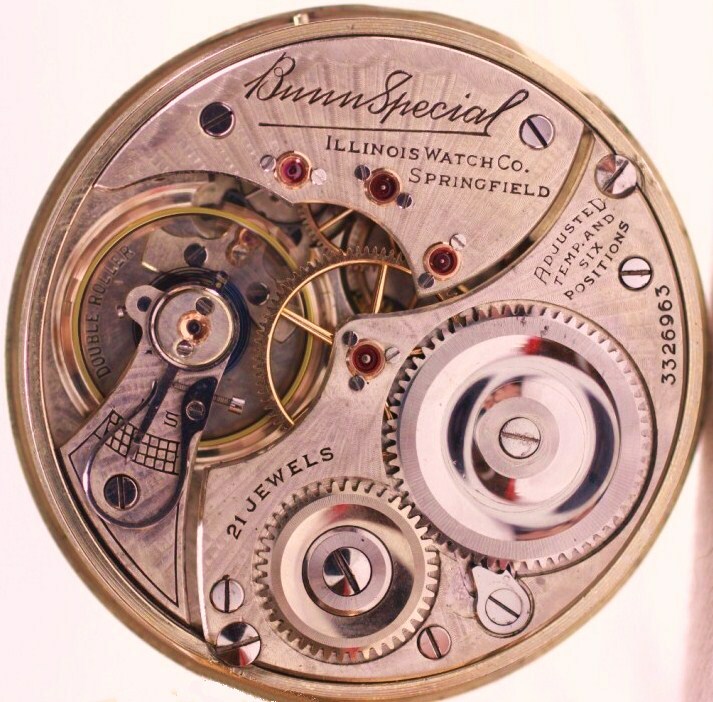 The Bunn Special in 16-size was sold as a movement only with casing done by retail jewelers in a customer chosen case...this was the only choice until 1925 when factory cased movements became an option while standalone movements would continue to be sold. It is cased in a "display case" and bears "Illinois Watch Co." engraving on front and rear bezel edges. 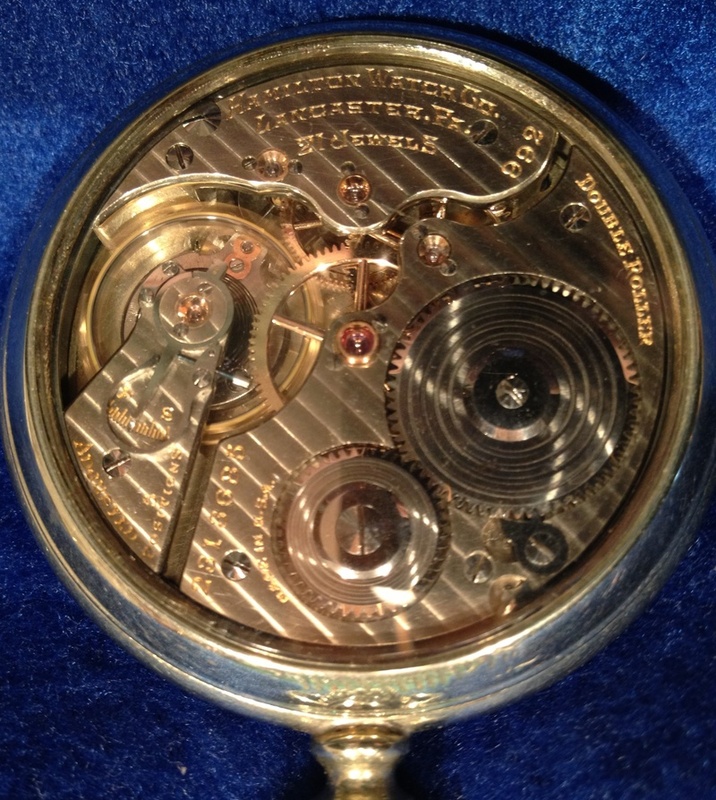 As with my other display cased watches, this sort of case was NOT the way these movements left the jewelry store, rather they were a selling tool to showcase the dial/movement combination as these pocket watches were sold uncased by the factory. Case choice was a separate decision at the jewelry counter. I seek out these less common display cases for the sheer love of being able to watch the mechanism do it's thing without having to take the rear bezel off or disassemble the watch to see the movement in action. Upon buying this watch, I had a complete servicing done by watchmaker Chris Abell. Chris' work is exemplary and I highly recommend him. 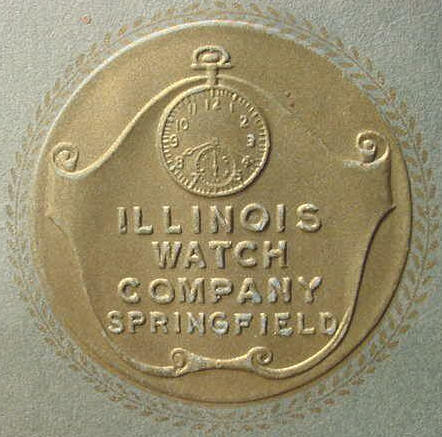 The Illinois Watch Company was purchased by Hamilton Watch Company in 1927, but continued to produce Illinois watches under Hamilton management until 1932 (the year the last "true" Illinois watch was made). 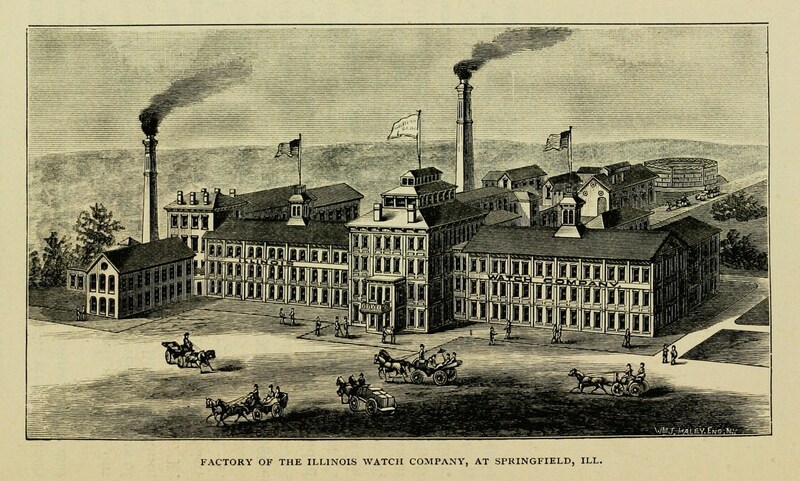 Hamilton continued producing Illinois watches in the Hamilton factory until 1939. 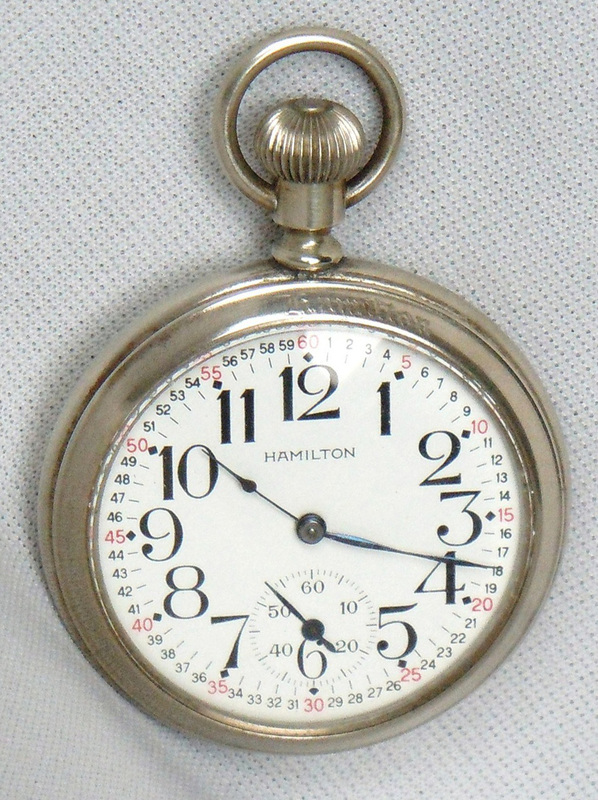 The 992 model was the most successful pocket watch made by Hamilton who produced more than 1 million of them between 1912 and 1957. Hamilton made them in Lancaster, PA with both form and function at a pinnacle. This specific 992 watch was made in 1925 per the 2313685 serial number. The case is a #16 size at 2 inches in diameter. The Double Sunk (D.S.) dial is enamel, with crisp black Arabic numerals. Outer track is a combined red 5-minute and black 1-minute. The 992 was built to railroad standards of the day which required that the time setting function could not accidentally be bumped, as precise time was critical to the engineers and conductors who carried these watches. Hamilton accomplished this with an internal "lever set" feature. To change the time, the user must purposefully remove the front cover, pull a small lever near the 2 o'clock position and THEN adjust the time with the top stem in the usual way. After pressing the lever back in and replacing the front cover, turning the stem now will only wind the watch, not change the time accidentally. Case reverse (with mineral glass cover on)..."Narrow Stripe" damaskeened pattern can be seen clearly in this photo. Hamilton also offered a wider stripe pattern, but of the two I prefer this one and sold off a wide stripe example! I like seeing how things work, so I fell in love with this Hamilton 992 given it had a mineral glass front and back display case marked "HAMILTON" on both bezels vs. the typical unmarked glass front/solid reverse. The display case variety was supposedly used by watch salesmen to showcase the inner workings of a dial/movement combination to potential jewelry store customers who would then have that combination placed in a case of their choice. The display case appeals to this collector, but would probably not stand up to the rigors of railroad use with mineral glass front and back. I had a complete servicing of the 992 done in March 2013 by watchmaker Chris Abell, and I want to put in a plug for his work which was superb. This Waltham Crescent St. Railroad Watch is a beautiful 21 jewel, high grade model 1908, circa 1926. I usually show the movement photo AFTER the front/dial photo, but in this case I break my own rule. This movement is simply gorgeous and on par with my Illinois Bunn Special! You can see how in the late 1920's Waltham was out to catch Hamilton and Illinois with "over the top" damaskeened movements. They don't get much more dazzling than this! It even has a snowflake around the center jewel! NOW, the front side with clear bezel on! The watch winds like a new one and can't have seen much use. 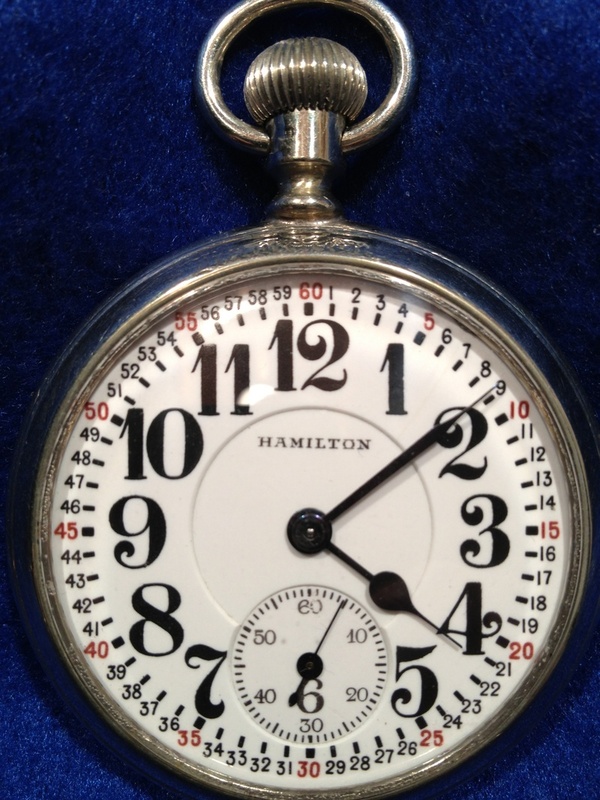 To showcase this gorgeous dial and movement, I have recased it in a spare Hamilton salesman's display case featuring clear glass front and rear bezels. If I find a Waltham case like this or one without the Hamilton engraving, I will again recase it, but for now, this will "do". Rear side with clear bezel on. Dial with front bezel off is also looking like new...a very handsome watch indeed. Though in nice shape as received, I want to keep it that way and sent it in April 2013 for a full COA by my certified watchmaker, Chris Abell. 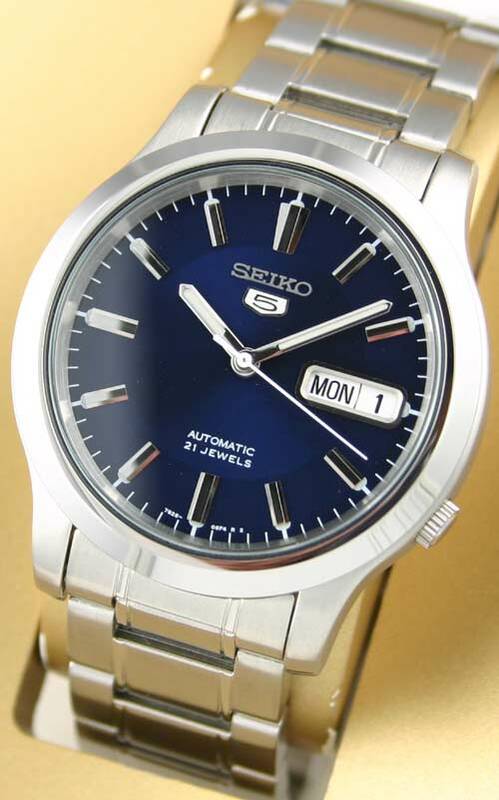 I have admired Seiko mechanical watches for many years, but until recently this Japanese brand simply cost too much for my liking. BUT, when their entry level Seiko 5 could be had for under $60 via Amazon.com (Sept. 2014), my price resistance ended and I happily bought one in Mar. 2013. The Seiko has a certain mystique for me and I was almost giddy to finally get one. They may be made in Malaysia now, but the fit, finish and reported performance is still superb. Mine came with the 21 jewel "caliber" 7S26C movement and is as perfect as I hoped for. A clear/viewable reverse was the deciding factor on this watch, so one can see the inner workings...a common theme in each of my watches. This Seiko is quite robust including the stainless steel bracelet, and though I am careful to not abuse it, I wear it if my day's tasks might be too physical for a more delicate watch. The quality is outstanding and I'm happy to finally be a Seiko owner...stories of decades of operation without service are legend with this model...I hope mine holds up like that!!!! Though I was leary to consider modern watches of Chinese origin, I did some reading on the Sea-Gull watch company, in business since 1955, and currently making about 1/3 of the worlds mechanical watches. Notice the prominent "China Made" on the bottom of the dial. Sea-Gull is proud of their heritage unlike some Chinese watch makers who try to hide their origin behind fancy names or no name/ID at all. In my opinion this watch rivals anything coming out of Switzerland and at a fraction of the price Swiss watches command. As an aside, many Sea-Gull movements are being installed by the Swiss manufacturers themselves, then the watches are passed off as "Swiss Made". I feel a watch's heart and soul lies in the movement and I prefer to buy a watch from those who MAKE the movement vs. just repackage it! Given rave reviews for Sea-Gull by owners on several watch forums, I decided to buy the M171S and now 18 months later I am still delighted with it. I like a quality, artistically appealing movement first and foremost, but the attention to detail visible in the M171S's dial, hands, case and leather strap with double butterfly deployment clasp are first rate in every way. "Stunning" is an understatement! What initially drew me to this model was the "open heart" or "flying wheel" as Sea-Gull calls it, an open, round viewing port in the dial where the oscillating balance wheel is clearly visible. I really love this feature and I find myself staring at that "flying wheel" quite often. I think I could be a good candidate for hypnosis! In addition to being auto-winding, the M171S offers retrograde day and date indicators and of course, a clear reverse to enjoy Sea-Gull's ST2504 calibre movement with 33 jewels. The M171S also features blued internal screws seen from the reverse and nice damascening of the inner components including the auto-winding rotor. Another nice detail is an etched "S" in the surface of the crown. Sea-Gull makes no qualms about it's cases being made of stainless steel. That is fine with me, I like a beautiful watch, but it needs to be durable as well. I picked this watch up for two reasons...it is powered by a Sea-Gull movement...a brand I have a lot of respect for, and I just liked it's looks from the simple but robust front to the see thru back with it's attractive damascening. OK...one more silly reason...I love the name ZULUDIVER ! It might sound silly, but if you have more than one auto-winding watch, you have to re-set the watch that has sat around a few days unworn. How hard could it be to wind and re-set? It's not hard to rewind and set a basic time only watch, but watches like the Sea-Gull M171S and the Seiko 5 have day/date features which when left to wind down are a PITA to reset. 'Til I got my watch winder...I wore a watch on each wrist to ensure my three auto-winders did not run down, rotating in the third every other day. BUT, I must admit I looked ridiculous wearing two watches and needed a better solution. I found the better mouse trap in the form of a Belocia brand two watch winder bought off Amazon.com. Mine sits on a shelf over my desk taking up a space 6" x 6" by 10" tall and plugs into wall power. The black door on the front has two windows so you can see which watches are inside. The door swings to the left for access, but closes to keep them dust free. It takes just seconds to remove a watch and place another on the spring loaded blocks that snap into the rotation sockets. The Belocia will keep two auto-winding watches always wound and ready to go in a day, week or month since last wearing them. It rotates both watches simultaneously for one of four alternating clockwise/counterclockwise cycles over 24 hours. Each morning I usually swap out the watch I wore the day before for one in the winder and put yesterday's watch back in so it remains wound. The Belocia pictured above has been running silently and flawlessly now for 24 months as of Sep. 2014...not bad for such a low cost unit. As I have done with my steam engines and their accessories, I've created this one bucket of sorts with a single photo of each clock or watch that has passed into but then out of my collection. Having begun collecting timepieces in earnest since only 2012, I've actually turned over a fair number of timepieces now that I look at this list, but for me that is all part of the enjoyment...try a piece on for size, if it doesn't move me...out it goes to free up funds and space for another candidate. (I had wanted to sell this clock for some time...but my wife Nancy loved it. So, Valentines Day 2015 guess what she got with a big bow on it. Unfortunately Nancy died in 3 months later, so this clock passed to my eldest daughter Kristin....it carries on in her office). (hand made walnut case, movement view able from 3 sides...a really beautiful clock I now regret selling. To remedy my regrets, a similar one has just been found on eBay as of Sept. 2018 and will soon replace it. I love the side windows that let me watch the movement move from all angles). (Fell for a pretty face, got it very cheap and got my money's worth. Korean movement was a piece of junk. I ultimately dropped the whole thing in a dumpster when it quit working. Movement was total junk...Waltham in name only...in retrospect, I should have kept the case and inserted any other movement that worked...doh).